Almost a month after the 30 November national vote, Romania finally gained a new government. The Liberal Democratic Party (PDL), a centre-right party close to president Traian Basescu, and the alliance between the social democrats and the conservatives (PSD-PC), old and relentless opponents, have come together for the "good of the country" amidst the economic crisis. They share half the 18 ministerial seats. The "grand coalition" formed by the parties that won most votes allows the new government to have the support of 329 out of the 471 deputies in Romania's Parliament. The government is led by Emil Boc, 42-year-old president of PDL and the youngest Romanian prime minister in post-revolution Romanian history. Boc was nominated following the sudden rejection of Theodor Stolojan's nomination, who entered the elections as the liberal democrats' candidate for prime minister. Five days after receiving the mandate to form a government, Stolojan, who is 65 years old, announced his retirement with a not very credible explanation. Speculations spread about the true reasons for his action. Stolojan briefly stated that "two party presidents, Emil Boc of PDL and Mircea Geoana of PSD signed the 'Partnership for Romania' and therefore they must continue to collaborate, by assuming the most important offices in the country, of the prime minister and the president of the Senate." However, this explanation did not convince everyone. 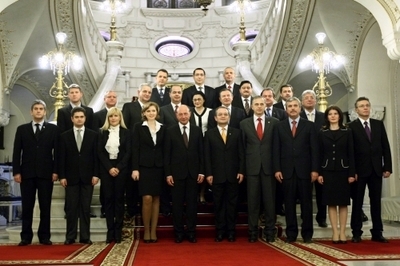 Stolojan had previously withdrawn, directly or indirectly, in favour of President Basescu. In 2004, he stepped aside to make way for Basescu's bid at the presidency. Now, he is clearing the way for Boc, who is president of the party close to the Romanian head of state. The media speculate about Stolojan's inability to withstand the pressure he was under, or of an old health problem, which has resurfaced (some say he suffers from depression). Whatever the real reason for the rejection, his action might have serious consequences in a time of crisis. Stolojan is an economist, whereas Boc has a degree in history, philosophy, and law. According to the Bucharest daily newspaper Free Romania, "The president's promise of a government made of professionals has already been broken." In addition, most ministers do not have direct experience in their departments. On the other hand, Boc said he would surround himself by experts. Although the PDL-PDS-PC coalition represents over 60% of the votes cast last November, in the first election after Romania's entry into the EU, the press has extensively criticized the new government's composition. Almost 70% of the ministries are taken up by former ministers. For Evenimentul Zilei, this government is a product of special-interest lobbies. Elena Udrea, for example, will run the department of tourism and her husband owns hotels. The health ministry will be directed by Ionut Bazac, a physician and founder of Red Power, the company which imports Ferrari in Romania. The daily newspaper Gandul Thought comments that the government has no lack of oligarchs or their associates. The incapacity of the liberal democrats and the social democrats to nominate a candidate to lead the Ministry of Justice has been interpreted as a symptom of the parties' difficulty to find a common vision to fight corruption. In the end, the nominee was Catalin Pedroiu, now considered a traitor by his colleagues in the Liberal Party of former Prime minister Calin Popescu Tariceanu. The liberal democratic ministers are in the economic sectors (Adriean Videanu, former mayor of Bucharest from 2005 to 2008); finance (Gheorghe Pogea); transport (Radu Berceanu); and defence (Mihai Stanisoara, former adviser to Basescu). The social democrat-conservative alliance received internal affairs (Gabriel Oprea); foreign affairs (Cristian Diaconescu); labour (Marian Sarbu); education (Ecaterina Andronescu); health (Ionut Bazac); and agriculture (Ilie Sarbu). In order to avoid recession - already economists predict the current 8 % rate of economic growth will be cut in half - the new government must revive the reforms postponed for the past two years, as well as pursue a wise fiscal policy. The Boc government will encounter difficulties not only because of its liberal background, but also because it will have to reconcile the rightwing measures promoted by the liberal democrats with the leftwing ones promoted by the social democrats. The social democratic ministers of interior and education will have to deal with the strong demands to increase wages, whereas in the liberal democratic camp the minister of finance will have to reduce the current account deficit. The transport minister will have to confront the 1.84 billion lei shortage in railroads; whereas the chief of economy will need to launch construction of a nuclear power plant in Cernavoda. The new defence minister will need to decide how to renew the air force, and to replace the archaic Mig-21. The liberal democrats have signed a "Partnership for Romania" agreement with the social democrats and the conservatives, which contains a protocol with the strategic priorities for the government, keeping in mind above all the economic crisis. But the former liberal prime minister Calin Popescu Tariceanu, now chief of the opposition, believes that the government program's social measures would produce economic instability, unemployment, and poverty. Former finance minister Varujan Vosganian also warned that the deficit might reach 6% of GDP if the PDL-PSD government delivers on its promises, such as reducing the VAT tax and various fiscal subsidies. The new government has kept the 16% flat tax introduced by the Tariceanu government: which is considered a rightwing measure. However, its program also has many leftwing measures: the government proposes to reduce the VAT from 19% to 5% for basic foodstuffs, and to raise VAT to 25% for luxury goods. The initiatives promoted by the Boc government also include tax increases on property, vehicles, and boats. The program foresees a rise of pensions and the minimum wage starting 1 January 2009, and doubling of assistance for families with children from 1 January 2010. According to the government's plans, the Romania's minimum wage should reach 500 euro by the time Romania enters the Euro Zone (2012-2014), whereas the average salary should rise by 60% over the next four years. Some analysts, however, note contradictions, such as the government promise to reduce deficit spending to 2.5% of the budget, while simultaneously increasing public spending. At the same time, data on possible financing remain vague.